GLENDALE – Seventeen months after Glendale voided its 15-year lease with the Arizona Coyotes, the NHL club announced plans Monday to move to a new arena in Tempe in time for the opening of the 2019-2020 season. The team plans to move from Gila River Arena to a 58-acre plot of land in Tempe after entering into an exclusive negotiation agreement with the Catellus Development Corporation, master developer for the Arizona State University Athletic Facilities District. The planned 16,000-plus seat arena, with an adjacent 4,000-seat arena that would be home to ASU hockey, is on the northwest corner of E. Rio Salado Parkway in Tempe and South McClintock Drive, a mile and a quarter from the university’s main campus. The decision to relocate comes after a flurry of feedback from Coyotes fans who felt the arena in Glendale was a long trek from their homes. 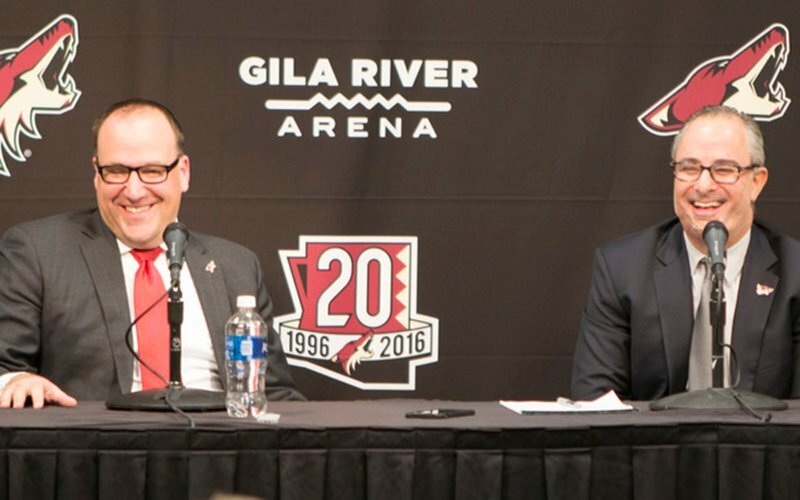 Coyotes majority owner Andrew Barroway said he received constant criticism about the location of Gila River Arena in his three years at the helm of the team. Heat maps also projected the majority of the Coyotes fan base is located on the east side of the Valley. Glendale officials did not respond to a request for comment. The arena in Tempe is projected to cost around $400 million, of which the Coyotes will pay around 50 percent, according to LeBlanc. The other 50 percent will come partially from Arizona State, whose land the Coyotes will lease for an extended period and partially from a public or private partnership with the team. The Coyotes hope the project “pays for itself,” which could come from tax rebates. LeBlanc said the NHL club is not asking the government to build the Coyotes a stadium. The Coyotes will be the first professional franchise to partner with a school to develop two buildings that will work for both partners. “We couldn’t be happier to be associated with a great institution like Arizona State University, which just happens to have the largest student body on their campus, which is attractive to ensuring that we fill the building,” LeBlanc said. Surrounding the buildings will be a plethora of restaurants and night clubs, including two night clubs planned to be built into the upper tiers of the arena which both buildings will have access to. They also hope the smaller arena will be a place to grow youth hockey and cultivate interest from a young age. However, this plan also comes with a lot of question marks, mostly concerning the financial aspect of the project. The biggest question remains in the hands of the state legislature. “This is all contingent on the state legislature first off seeing the plan, then they need to test the plan and then they need to approve it, which we hope they will do,” LeBlanc said. The next step for the Coyotes will be finalizing their budget, design and operational plan no later than June 30, 2017. If approved, the arena will likely be ready for the 2019-2020 season. In the meantime the Coyotes will continue to play Gila River Arena.